Home · SOUND ARCHIVE · Tam Dalyell: ‘Lured on to the Punch’. Analysis: ‘Brewing Up War’ + Pym’s Dilemma. Unprepared preparations had been going on for weeks … It’s there in Hansard on the 3rd of April, and I believe it to be true: that this was, in a sense, the Argentines being lured on to the punch. I am not saying that she put up Galtieri to do this in the first place, but what I am saying that it was very definitely in the political interests of a Prime Minister lower in the opinion polls than any Prime Minister had been since Opinion Polls started, at that time, to let it run. You asked me about Francis Pym. I believe that Francis Pym was a basically honourable man. I believe that like Lord Whitelaw, also a holder of the Military Cross, that he knew what war was about and was going to Washington in the belief that he would be able to do something about it. I didn’t know until this morning what Malcolm Harper said about having not fixed up an official meeting with Perez de Quella – that this was all done through Anthony Parsons, and that is certainly a new fact. But you see what is impossible to swallow about the Pym mission is first of all that he didn’t contact the Americans on arrival because he arrived by Concorde, secondly that, throughout the morning he was with General Haig, then he went back to the Embassy and a phone call came through from Haig emphasising the importance of a Peruvian proposal, wanting to speak to Francis Pym but he didn’t have time to speak to Haig …for why? He had a plane to catch! A plane to where? To New York. Now, services between Washington and New York aren’t exactly infrequent. And, as we heard this morning this was a somewhat late engagement. The truth as I believe it was that he didn’t want to be in the position of accepting the phone call, because, had he done so, he would either have been in the position of deceiving the Americans, and if he deceived the Americans how could he remain as Foreign Secretary dealing with our closest ally? Or, he would have had to let the cat out of the bag … that he had been told by London that something was afoot – not necessarily that the Belgrano was going to be sunk. So in one very real sense the torpedo was not only fired at the Argentines but I believe in one sense that it was fired at Francis Pym; because the political situation was such that had anything gone wrong, Francis Pym, moved to the Foreign Office very much against the Prime Minister’s wishes, would have certainly gone from the Foreign Office to 10 Downing St. I believe, panel, that the events of 1982 … unfinished, reflect maximum discredit on those who made the key decisions. If I seem to be personal to the Prime Minister, t’s not a blanket attack on my political opponents – not the Conservative Party – not even the Cabinet: because, it is a known fact unchallenged, that for 33 days as between April 2nd and May 5th Mrs Thatcher never called together her full cabinet to discuss the conduct of the Falklands War. If I seem to be very personal it is because the Falklands War was very personal to the British Prime Minister. Tam Dalyell put forward no evidence at all to substantiate his ludicrous claim that the Argentines were somehow lured into attacking the Falkland Islands. The best he could manage was some meaningless blather about a missed phone-call. The reason why is simply: there is no such evidence. What is known is that defence cuts first proposed under Jim Callaghan’s government, and attempts to placate the junta that had being going on for decades, had led the junta to believe that there would be no British response to an invasion of the islands. 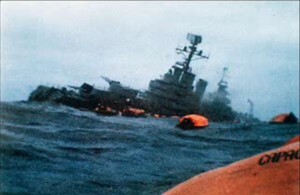 We can certainly blame Margaret Thatcher and her government for their failure to deter the Argentine attack, but her policy towards the Falklands was of a piece with the policy of previous governments. In fact it would make absolutely zero sense for Margaret Thatcher to intentionally lure the Argentines into attacking the islands because the invasion could easily have led to the down-fall of her government: all it would have taken is a single Exocet or torpedo putting a British carrier or one of the large troop-ships out of action and the war would have ended in defeat, a defeat that would have almost certainly have led to her exit from power and a routing of the conservative party at the polls.